Taking place now in universities across the UK, Freshers’ Week is a time of great ritualistic importance for many. It is like the country’s biggest party for (some) British teenagers, heralding the arrival of adulthood, and affirming one’s academic excellence. It’s also the chance to get really, really drunk. It’s also a marketer’s dream. We love to buy into images of ourselves, and especially positive ones; soaking up the right clothes, films, books and activities. Finally, we feel as though we fit in – are among a fellowship of peers. And, it’s true. We do fit in. Freshers go to the students’ union, drink Carlsberg, read the course books (or, some of them), make friends in halls, and sometimes become politically aware. They adopt left-wing views, become disillusioned, and boycott things. Freshers’ Week has the potential to be a lonely time, too. Beyond the traditional image of the eager, excited fresher, hungry for new experiences, there are also those who feel homesick, overwhelmed by the difficulty of the work, or the stress of suddenly managing their own life. Being a fresher is like a mad rush of all the good things in life: the chance to carve out a new identity, experiment with ideas, substances, relationships, and to feel a sense of belonging. However, this sense of belonging is something that springs from the inside, and should remain with the individual throughout his or her life. With a few exceptions, a person will always belong to their family, friends, partner, volunteer groups, work, and to their society (for better, or worse). 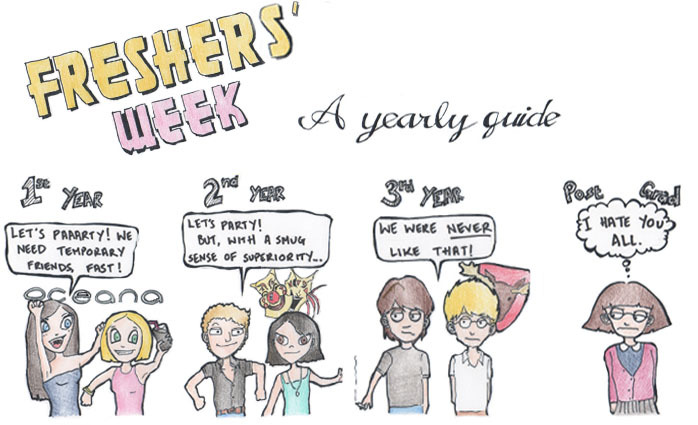 Freshers’ Week is a baptism of fire, but the lessons and meanings derived from it should last a lifetime. So, by all means, freshers should throw themselves into university, get involved, and make friends – while not forgetting that which will continue to be there – long after the last pint of beer is drained. P.S. With the wonderful benefit of hindsight, my friend Alex and I drew the above comic when we were cynical third-year students at the University of Southampton (though we weren’t allowed to publish it in the student newspaper in case it offended people). I feel it has only increased in resonance.